Do not choose between what you like and what you love! The Tasty Collection E Liquid gives you new gourmet and fruity sensations, for each of your needs. 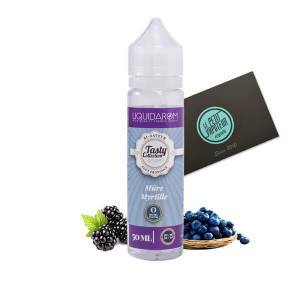 Made in France by Liquidarom, your Tasty Collection E Liquid benefits with complete control of its production chain and distribution. Each Tasty Collection E Liquid is prepared in 50/50 PG/VG which adapts to a large number of Electronic Cigarettes. Conditioned in a 50ml bootle, your Tasty Collection can hold a 10mg/ml Nicotine Booster if needed. Your Tasty Collection is of gourmet and fruity flavours which will meet your needs: Blueberry, Apple, Raspberry, Vanilla Cream, Bubblegum and many others. Make you choice! Each Tasty Collection E Liquid is made in France by Liquidarom and prposes 50/50 in PG/VG in a 50ml bottle , ready to boost. The Tasty Collection E Liquids benefits with complete contol of its production chain and distribution. Taste the Tasty Collection E Liquids, benefit with rich flavours, do not wait any longer to crack!